Q: We had a couple of warm days. Is there anything I should be working on for the spring? Rain, snow, wind and winter precipitation do a number on landscaping, so take some time to clean up the foliage around your pond. Remove fallen branches, rake leaves and debris, cut down cattails and pull out any pond weeds you can reach. Two great all-purpose tools to use for the task are the Weed Cutter and the Pond & Beach Rake. The cutter slices through floating debris like aquatic vegetation, weeds, cattails and phragmites; the rake, which works on land and in the water, allows you to mechanically remove those cut weeds, algae, muck and debris. Sunshine is a perfect excuse to tinker with outside toys, like your aeration system. Head out to the pond and check your air filters. Do they need changing? How’s the airflow from the lines? Is it what you expect? Is your air compressor operating properly? If needed, install new air filters, clean out your lines, and tune up your air compressor with a maintenance kit. Keep your system performing optimally – even if it’s still winter. Pond Dye can be used all year long. Even though the sun isn’t as strong in the wintertime, some UVs still get through – and they can fuel algae blooms that could affect your water quality. Pond dye shades the water and prevents those blooms from happening. Pond Talk: What’s the first thing you plan to do with your pond or lake when spring finally arrives? Q: How are algae able to grow in the winter when everything else is dormant? A: Algae can be tough little buggers. An estimated 72,500 algal species exist worldwide, and some of them can thrive in inhospitable conditions, including areas with ice and snow. With a handful of nutrients and a little bit of light, they’re able to grow – even in the 39 degree water under the ice in your lake. But if your lake’s water is clean and clear during the spring and summer, how can it explode with algae in the winter? Algae feed on byproducts of decomposing organic debris, like phosphorous and nitrogen, in the water. During the warmer months, natural bacteria would typically break down these nutrients, leaving little food for the organisms. But in the cooler months, those bacteria go dormant. That means the algae enjoy a feast – and a population explosion. If you keep a hole in your lake’s ice, you can help control the nutrient density with a product like Pond Logic® EcoBoost™. This bacteria enhancer, which has no temperature restrictions, binds suspended organics while providing trace minerals to fish. Simply mix it with water and pour it into the lake. Algae also require sunlight to thrive – but not much. Even through a clear, solid sheet of ice, algae can get enough light to use for photosynthesis. When that light is impeded, however, the algae won’t grow as quickly. A layer of thick snow cover is Mother Nature’s way of preventing light from penetrating the water, but you can also use pond dye, to block those rays. Pond dye is available as a liquid or in water-soluble packets that you can toss into your pond. Believe it or not, algae growth in the winter does have its benefits. It helps to filter the water, and on warmer days it’s a great snack for your fish. Plus, when the algae photosynthesize, they give off oxygen as a byproduct – which is then available for your fish (and other aquatic critters) to breathe. Don’t worry: The algae won’t take over your pond like it does in the summer. It can grow, but the cold temperatures aren’t ideal for explosive outbreaks. Pond Talk: Have you seen algae growing beneath the ice in your pond or lake? Q: How can you tell if a pond is safe to walk on? A: Ice is fun—but it can be dangerous business. 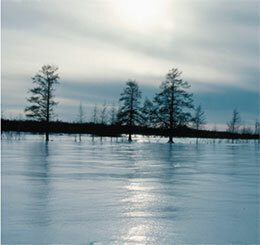 Winter brings cold weather and snow to your pond or lake, as well as a perfect layer of ice for skating, ice fishing, snowmobiling and more. You may want to get out there and play, but it’s important to know whether your ice is safe and strong or a potential hazard. Here’s how to determine whether the ice on your pond is thick enough and safe for wintertime fun. After about two to three weeks of freezing temperatures, a solid sheet of ice will begin to form on your pond or lake. But low temps aren’t the only thing that influence ice formation. Water currents, wind and snow coverage will also make a difference in the integrity of the frozen surface. So once the weather and temperatures stabilize after several weeks, you can venture onto the ice and inspect its thickness. Ice quality matters. When you inspect the ice, you can visually gauge its quality by looking for bubbles, trapped snow and cracks. You can also determine its quality by color, as a solid blue ice sheet is much stronger than a white brittle layer, which is caused by air pockets and other flaws. Of course, new ice is stronger than old ice, too, as temperature fluctuations haven’t thawed and refrozen the ice, which can weaken its integrity. In addition, if you’ve left your aeration system running while the ice has been forming, the ice layer will have air pockets—and be unsafe for winter recreation. You’ve given the water time to freeze and the ice time to form, and you’ve ensured the quality of the ice sheet’s surface. The next step is to verify its thickness. You can either drill or cut samples—but make sure you do so in multiple locations as you work your way toward the center of the pond as the water won’t necessarily freeze evenly. In general, a layer of ice less than 3 inches is too thin for most people to walk out on. It may be able to hold up lighter people or small animals but can easily crack. So if you plan to have a group of people on the pond or want to take your snowmobile out on your lake, an ice formation of 6 to 8 inches minimum is ideal. Winter recreation on an ice-covered pond is fun—but be patient and use extreme caution when venturing on the ice. Take time to inspect the ice quality and take samples because doing so can make all the difference between a blast and a disaster. Always make sure you have a life ring or floatation device within reach in case someone accidentally falls through the ice. And always use common sense when venturing out—better to be safe than sorry! 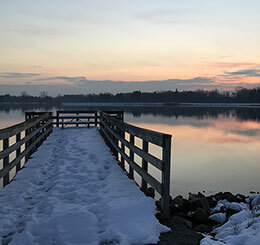 Pond Talk: What is your favorite wintertime activity on your frozen lake or pond? Q: How can I keep my dock from getting destroyed by ice? A: Ice can certainly do some damage to a dock. As water freezes, it expands. As it melts, it contracts. And all that freezing and melting business can wreak havoc on the wood and materials used to make the mooring. So what can you do to protect your investment? If you have a floating or removable dock, it’s easy. Simply remove it from your pond and store it for winter. If you have a permanent dock, you have two options: a circulator with float, or a bubbler system. Here’s what you need to know about them. A circulator, like the Kasco Circulator with Horizontal Float uses a motor and propeller to push water under the dock and up toward the surface. Kasco Water Circulators can be suspended from the horizontal float to create elongated patterns of water movement that discourage ice formation. With 5 angled positioning options, the flotation kit allows for easy adaptability for most situations. It can also be secured directly to your dock using the optional Universal Dock Mount. A bubbler system, like the Shallow Water Series™ Aeration System, uses a diffuser to create water movement under the dock and prevent ice formation. Diffuser plates connected to an air compressor pump air below the surface and agitate the water. Multiple diffusers used together can create large areas of open water, particularly when they’re placed evenly across a small area in the shallow part of the pond. Another benefit: They cost less to operate than a motor and prop. Whether you use a circulator or a bubbler system, remember that the weather will be the most influential variable in protecting your dock. The warmer the weather, the easier it will be to keep the ice melted; a warm, sunny day can open up a hole 10ft. or more. Cold, windy weather, however, can cause that hole to shrink to a couple of feet or less. Good luck preventing that dock from being destroyed by ice! Pond Talk: Do you prefer a dock-mounted system or a bubbler? Q: If I’m going to shut my aerator down for the winter, when should I do it? A: Ice skating, hockey, curling, broomball, ice fishing—part of the joy of having your own pond or lake is all the wintertime sports that can be played on the ice. These frosty, fun activities are the main reason why folks shut down their aerator for the winter, as keeping one running will create a hole in the ice and make the ice unstable. If you plan to turn your lake into an ice rink this year, turn off, pull out and store your aerator before the ice begins to form. Why? Because if ice that forms on the water surface has been moving for even a short time, it can be porous and not suitable for skating. Even movement on one end of the lake and not the other can make the ice at the edges unsafe. Unplug and shut your aeration system down completely. It’s critical to do this before the ice starts to build on your pond’s or lake’s surface for the safety of those who will skate on the pond. Stow the cabinet and compressor away. Your airline and plate may stay in the pond, but the system’s cabinet and compressor should be stored indoors to keep dry and prevent condensation and rusting. Cover flex tube and airlines ends. Doing so will prevent debris from entering and plugging up the airlines. Have an emergency plan, just in case. While you’re prepping your lake for ice skating fun, now’s a good time to make sure you have water safety items available, too, like a Life Ring. If the ice breaks, a safety preserver like this can save someone’s life. If you’re not using your pond for winter activities, keep your Airmax® Aeration System operating all season long so your fish will survive a winter fish kill caused by lack of oxygen. Don’t forget to move your diffuser plates out of the deepest water. This will give your finned friends a safe zone and prevent the super-cooling effect that happens in the chilled winter water. 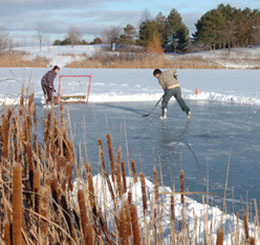 Pond Talk: What are your favorite wintertime sports? Q: I know my fish will go to the bottom of the pond for the winter, but do I need to do anything for turtles? A: Turtles are smart critters. Unless your terrapins are terrarium-dwellers that aren’t accustomed to the great outdoors, they instinctively know what to do to prepare for winter. They take their cues from Mother Nature—so you can simply let them do their thing! Read on to learn more. When air and water temperatures start to chill and their food source become scarce, turtles will slow their metabolisms and look for a place to hole up for the winter. Different types of turtles prefer different types of winter homes; water-loving turtles will swim to the bottom of the pond while land-based turtles, like a box turtle, will burrow in the dirt or mud at or near the pond surface, where they’ll stay warm and cozy. Just like fish, turtles will stop eating as their metabolism naturally slows to a cold-weather crawl. They’ll start to hibernate—or brumate, as termed in herpetology—when they’ll require very little oxygen, their heart rate will slow to just a few beats per minute and they’ll sleep the winter away, only to wake up in the spring when temperatures increase again. Though turtles don’t need a lot of oxygen while they’re hibernating, they do appreciate a healthy pond with clean, O2-infused water. Provide that to them by completing your fall-maintenance chores, like cleaning up dead or dying debris, and keeping your aeration system running over the winter. That moving, oxygenated water will ensure your shelled pond pals will get a good winter’s sleep. Pond Talk: What kinds of turtles do you have around your pond or lake? Q: My water quality is good, but what should I do over the winter to keep it that way? A: When it comes to doing chores at the pond, it is easy to let your guard down this fall. Thanks to your hard-working bacteria, the water is clean and clear with minimal algae, and your fish are happy. You have nothing to do but coast into winter and hibernate until spring. As water temperatures drop, those bacteria and algaecides stop fighting off excess nutrients and cold-temperature plant growth. They are no longer effective at their jobs, and so you need to step in and help. Here’s what you can do to maintain pristine water quality over the winter. Add Some EcoBoost™: Formulated to bind organic debris suspended in the water, Pond Logic® EcoBoost™ helps to clear water and enhance beneficial bacteria. It also provides more than 80 trace minerals to fish, keeping them healthy over the winter. EcoBoost™ has no temperature restrictions, so you can use it all year round. Simply mix the powder with some water in a pail and pour it in the pond. Tint with Pond Dye: During the cold temperatures and even iced-over conditions your pond’s bottom can still be exposed to sunlight. Pond Dye can be used year-round – winter included – to shade your pond from the sun’s UV rays. The dye also imparts a dramatic hue to the water, giving it a great look when it ices over. Aerate and Oxygenate: You can also improve water quality through the winter by keeping the oxygen levels up and water circulating. If you are not going to use the pond for ice-skating or hockey, we recommend you use a subsurface aerator, like the Airmax® Aeration Systems. The system will keep the air bubbles flowing throughout the water column while maintaining a hole in the ice for gas exchange. If you have a fountain running, remove it and store it for the winter. Ice can damage the motor in the pump. Before you hibernate for the winter, spend a few hours out at the pond to prepare it for winter. When you look out on a crystal clear pond in January, you’ll be happy you did! Pond Talk: How do you keep your pond clean and clear during the winter months?